For some reason, I have always been drawn to murder mysteries. I especially like the set-up of the “house party murder” mystery movie. A bunch of people go to a house or mansion and they start dying one-by-one, or one person dies and the rest have to figure out who the killer is. I have always found much joy in the set up. I love “House of Haunted Hill” and I love watching it every Halloween. I have enjoyed all versions of “And Then There Were None.” One of my favorite Family Guy episodes is the two-part parody “And Then There Were Fewer.” There is something intriguing about the murder being in the same vicinity as all the innocence and how they must figure out who the killer is. I find great fun in the premise. “Murder on the Orient Express” is pretty much like “And Then There Were None” except on a train. Sort of. People aren’t dying left and right. You will have to forgive my ignorance, but until tonight, I had no idea that both the “And Then There Were None” and “Murder on the Orient Express” were books written by Agatha Christie. I guess I shouldn’t be surprised though, both stories are clearly born from the same wheelhouse. Christie’s “Murder on the Orient Express” is one of many Hercule Poirot novels she wrote, which revolved around a Belgian detective of the same name, who self-proclaimed himself as the best detective in the world. “Murder on the Orient Express” has been adapted four times, including this 2017 version, and now I am curious in tracking down the other versions in watching them, simply to see how they differ from this version. 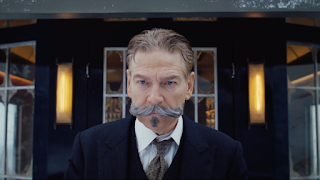 In the 2017 version, we have Kenneth Branagh playing Poirot. He’s got his mustache twirled at both sides, he’s got stylized hair and a stylized costume, and he speaks with a peculiar accent. It’s clear why Poirot self-proclaims himself the best detective in the world, he sees things the average commentator would easily miss. He’s like Shaun from USA’s “Psych” except with a wild accent, and wilder appearance and living in the 1930’s. We meet Poirot at the tail-end of a job, and now he’s ready to go home for a quick vacation before signing onto another case. A friend gets him on the Orient Express to travel across from Jerusalem to Europe. The trip seems to be going normally until the train derails from an avalanche, and there is also the death of Samuel Ratchett (Johnny Depp) a slimy American businessman Poirot encounters on the train. Everyone is a suspect and Poirot has to solve the case before the train gets put back on the rails and before they skid back into the station, where the police will just bag anybody they see fit, apparently. The train features an all-star cast; including Michelle Pfeiffer, Daisy Ridley, Josh Gad, Willem Dafoe, Derek Jacobi, Leslie Odom Jr, Judi Dench, Penelope Cruz, and Tom Bateman. That cast right there is enough to get anybody excited, but I was bit nervous. When literally every character, supporting or lead, is occupied by a star-studded actor, it can lead to “The Departed” or it can lead to “Bonfire of the Vanities.” Sometimes all those egos get in the way, the director doesn’t manage them, and it can run the risk of failure. Kenneth Branagh has already made his share of films, and managing several personalities is something he has mastered. The result is a well-acted, fun mystery movie. It’s definitely a hyper-stylized take on the material, where all the details are almost otherworldly and there is a ton of CGI. I won’t say that it overly- relied on the CGI, but more natural scenes may have fit the story better. All the actors do incredible work here, all pushing towards a collaborative goal of telling a good story and telling it well. I can’t honestly say that anybody sticks out in particular, and I think the entire cast hits some strong strides throughout the film. No doubt, the character that will keep your eyes glued to the television will be Branagh’s Poirot. It’s such a strange performance that you will either like him or detest him. There may not be any middle ground. I will admit that I was entertained by Branagh’s performance, even if it’s a little hammy and overreaching at times. No doubt the biggest problem with the film, and this has been a problem in a number of Branagh’s earlier films, is the guy is completely devoid of shooting action. When things get action-packed, no matter however so slightly, everything seems hard to follow. Branagh makes confusing action scenes, even in Marvel’s “Thor,” that it takes you out of the experience all together. There are only mere moments when things absurdly break out into action, and those are the moments that fail hardest in the movie. If Branagh is going to continue to put action sequences in his movies, he is going to have to get better at directing them. The film is more dreamy than realistic, but there is a grandeur feeling throughout the whole running time. Haris Zambarloukos’ cinematography makes each scene absolutely luminous, like you just woke up and took a plunge into your wildest dreams. The music by Patrick Doyle is operatic in a powerful way. The screenplay by Michael Green works in a fairy formulaic way according to other movies like these, but keep in mind I never read Christie’s book before seeing this, I never saw the other versions before seeing this, this is my first exposure to this story. There are definitely some tropes that Green abides by, but the film plays fun overall. The film is a technical marvel and the all-star cast definitely came to play, and everyone delivers a memorable performance.